"I was raised to be a well bred lady with good morals and much respected values. I have danced ballet, tap, and jazz since I was three. I often took piano lessons and enjoyed Girl Scout camp. But, when I was in sixth grade, I looked in the mirror and the image of myself had faded. I did not see myself as a "white" girl, with beautiful features. I saw myself with dark skin, and dark brown hair and it left me confused. I wonder whether other people saw me as an "Indian" or a "white" girl. On the inside, I was white, but on the outside I was Indian." "I am adopted and was raised in a non-traditional atmosphere. 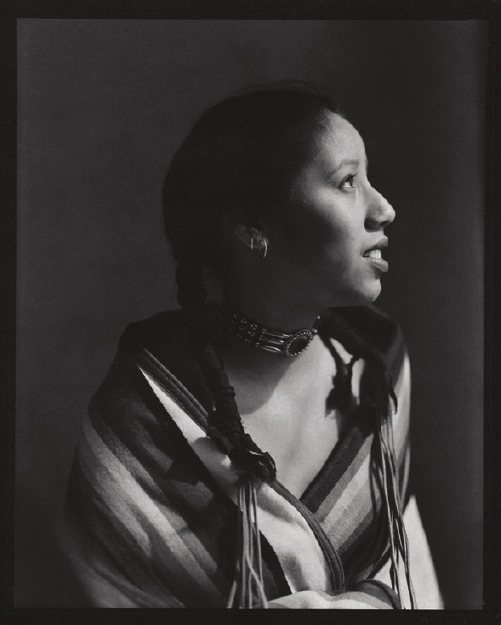 As a young adult, a gentlemen friend by the name of Thomas introduced me to the Pow Wow world. Just barely eighteen I experienced the best summer of my life. 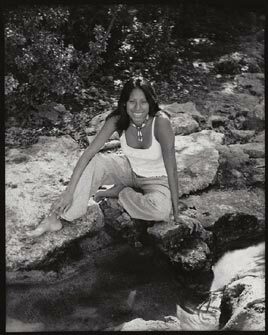 In the fall of 1999, I was accepted to Haskell Indian Nations University and learned more about the Indian way of life than I can ever have imagined through any book." "While attending Haskell Indian Nations University, I began to learn how to dance, 'Fancy Shawl'. It's not a traditional dance. It is a contemporary move rather than for contest. The regalia worn by the dancer is represented by symbols of the dancer's tribe. I have also had the pleasure in participating in a peyote meeting while living on campus. I did make my entrance into the arena at the Kiowa Pow Wow and also had a giveaway." "When Gary took my picture I felt that he had captured me in a time of true love. I knew no boundaries of time because that is the way Thomas (my fiancé) made me feel. In one of my photographs, I am looking up at Thomas and I can't see his face because the sun was so bright. But I know every little detail of his face and at that particular moment he was a gentleman and I was a lady." "I am now engaged to a man from the Tohono O'odham tribe from Arizona. We have a beautiful daughter together and two sons that are wonderful. We plan to raise our children with all the knowledge of our people that will be passed on to their children. We value education and family and hope that one day our children will do the same."